I'm a versatile professional musician (saxophone, melodeon, trombone, voice). I have been gigging for years in a variety of projects: Uzivati, Virevoltes, the Brussels Conservatory big band, The Boneshaker and Acoustica trio in London, as well as in solo and duo forms all over Europe. I love sharing my experience and my passion for music, which is why I very much enjoy teaching! 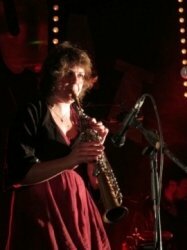 I have a masters degree in saxophone and a lot of one-to-one tuition experience under my belt: I have been teaching for 6 years in Belgium. I am now based in London where I endeavour to develop a similar career as a music teacher and a musician. I love one-to-one tuition because they enable me to really connect with, and adapt to, the student I am working with. I believe music learning to be very personal journey so I endeavour to adapt my course to the specific objectives pursued by the student, whether it's passing an exam, playing a specific tune or genre, or generally developing his/her musicianship.